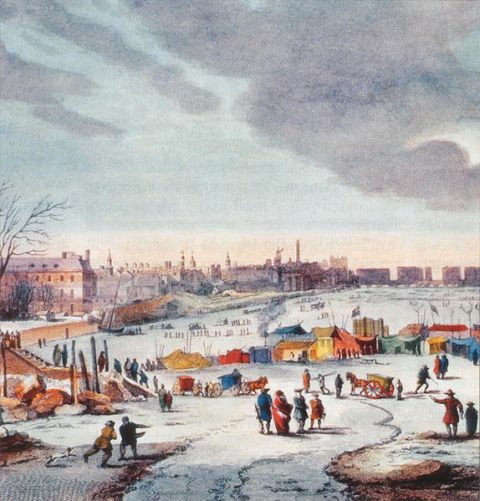 From about 1550 the climate again grew colder with the intensification of what is known as “The Little Ice Age” which had begun in 1320s. 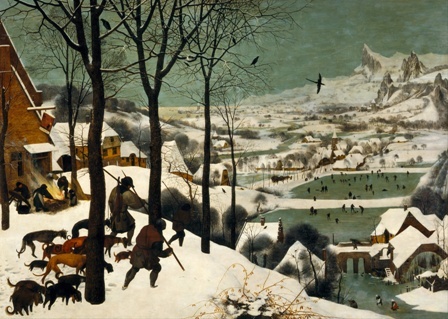 In February 1565 Pieter Brueghel the Elder painted his famous picture Hunters in the Snow, one of the first landscape paintings ever to be painted, which started a fashion for Dutch winter landscapes. It was the coldest winter in living memory, and a symptom of the sharp deterioration of winter temperatures that brought snowfalls to the Swiss Alps twice as often as in the previous twenty years. The cruelty of the cold apparently also inspired Brueghel to change the setting of his 1563 painting of the visit of the Magi to the Holy Family in an open stable. 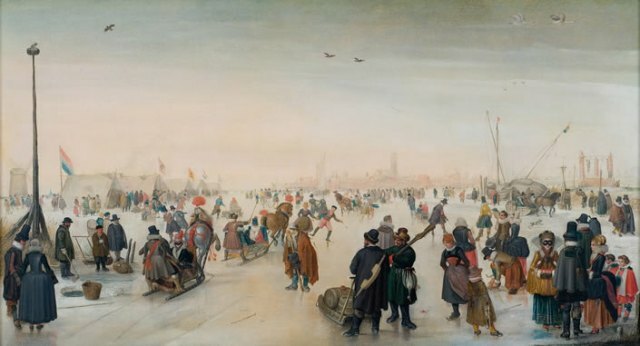 When he painted the scene again in 1567 the building was set beside a frozen river near a village with snow falling, relating it to the harshness of the rural life of his times. The last half of the 1580s had cold snowy springs and wet mid-summers, seriously affecting the harvest, and in 1590 famine struck Italy, Spain and France. In 1595 the sea froze at Marseilles. Hundreds of thousands of hard-working peasant families died in abject poverty and misery. Well might Montaigne, who died in 1592, write: Le continuel ouvrage de votre vie, c’est bâtir la mort (The unending labour of your life is to build the house of Death). From this time on, the whole of the western Mediterranean would no longer be able to feed its inhabitants, especially in the great cities. and had to rely on imports. The Turks were now eating the grain from the plains of Thessaly, the Black Sea and the Nile delta, that had been so important in Classical times, and it was left to the post-glacial soils of Prussia and Poland, and the Baltic ports, to supply not just the northern seaboard but the Mediterranean cities as well. The Polish peasants, who were little more than slaves, were reduced to eating bread made from barley and oats, while so much wheat was exported that wheaten bread was only seen on the tables of the great lords. By 1610 almost 2500 ships a year were entering the newly constructed free port of Leghorn (Livorno) in Tuscany. The Dutch and English merchant ships dominated this new trade with fast heavily-gunned ships. Outgunned and outsailed, the Venetian and Italian traders lost their position as the leaders of European maritime trade, even in the Mediterranean.